It has been exactly three months since I last updated my blog. 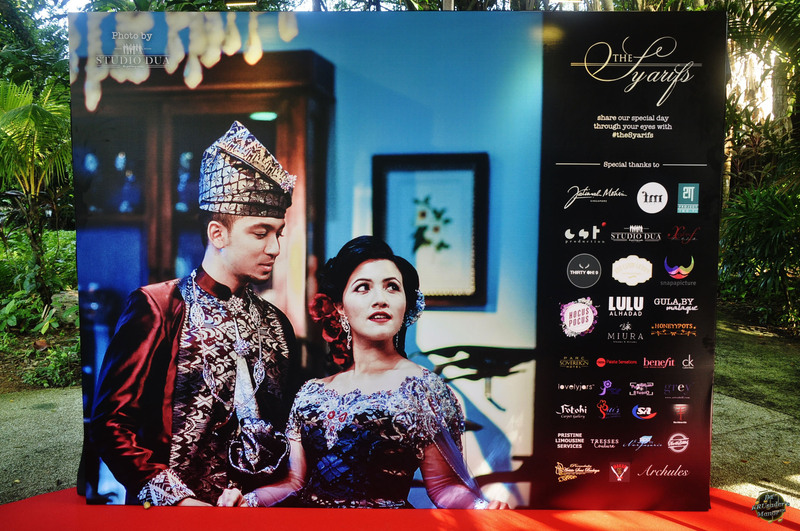 I remember I promised my next entry after Syah Ibrahim and Ana Wahyuni‘s wedding event would be photographs I snapped of Syarif SleeQ and Malaque Mahdaly‘s wedding, but events and circumstances happening in my own personal capacity made it impossible for me to update my blog. For that I apologise for not keeping to promise, but blogging was the last thing on my list of agendas as family took precedence. I was also partly hesitant to share the photographs, especially during the wedding and dinner events, because since the wedding, Malaque has taken the decision to cover up and don the Hijab and I personally don’t feel comfortable sharing the photos without first seeking the couple’s permission. Thankfully I met them at an event this past week, and they have kindly given their blessings to share and so here I am with this entry, my first for 2015. I believe I do not have to relate so much on what happened during the solemnisation event, as you can still view this beautiful ceremony in its full glory via its official YouTube channel “the_Syarifs“. I was and still am impressed by the whole event and how fairy-tale like it turned out from morning till night. What’s more significant was the fact that this was the first time a live streaming of a wedding event by a local Malay personality was done for a worldwide audience. Correct me please if I am wrong or misinformed, but this was probably the first personality in Singapore who had his wedding event streamed live to the world. Even though Syarif & Malaque‘s wedding was equally grand alongside Syah Ibrahim & Ana Wahyuni‘s, the former wins hands down for the global outreach their event made, even making it trend on social media that day. All these was made possible by the brilliant CST Productions team.